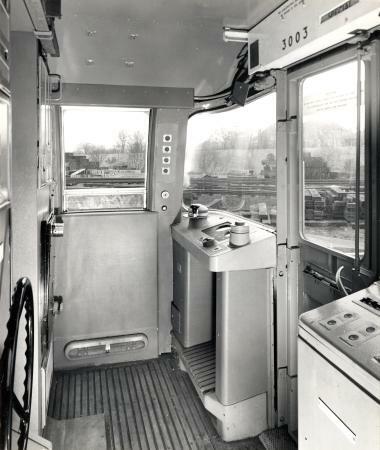 The inside of a 1967 Stock train after it was refurbished. The London Underground 1967 Stock was a deep-level tube stock that ran on the Victoria line from 1968 to 2011. These trains do not run on the London Underground anymore as they were replaced by the London Underground 2009 tube stock between 2010 and 2011. The stock was built by Metro-Cammell. The trains have also ran on the Woodford–Hainault section of the Central Line in the past. An order to buy 30½ 8-car trains of 1967 tube stock was made in March 1964. They were built by Metro-Cammell. Each train is made up of two 4-car units that are joined together. The trains cost £2.25 million to build. Today this would buy just three trains. 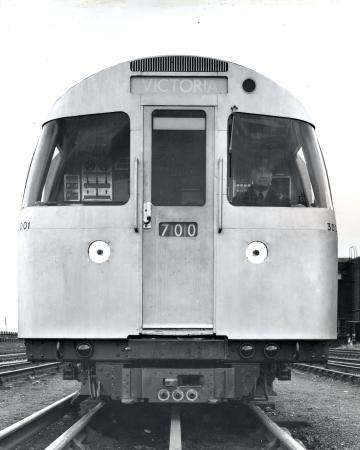 The first unit was delivered to West Ruislip depot on 27 September 1967, and the fleet was bought to run the Victoria Line. The units were then tested at the depot, before they were moved to Hainault depot and being tried out in passenger service on the Woodford-Hainault shuttle on the Central line. Once the tests were finished, the trains were moved from Hainault to Northumberland Park Depot using a battery locomotive. The trains were looked after at this depot until they were scrapped. It is the only part of the Victoria line that is not Underground, and it is unusual because, unlike the rest of the London Underground network, there is a staff rail link from Seven Sisters station. The trains had Automatic Train Operation (ATO). The train operator controls when the doors open and close and also starts the train by pressing two buttons at the same time. These buttons start the automatic process of driving the train. The trains were built with wrap-around windows in the driving cabs and were the first London Underground trains to have windows like this. The trains were delivered with a shiny grey coat, but this soon faded to a dull grey. When the extension Victoria line to Brixton opened in July 1971, a further 72 cars of 1967 tube stock were ordered, which made up 9 trains. This brought the total number of 1967 tube stock trains to 39½. In 1989, a refurbishment programme was started across the whole fleet of London Underground rolling stock, following the King's Cross fire in 1987. The Victoria line stock was chosen to be the first to be refurbished (repaired, changed and made to look newer). The refurbishment was carried out by Tickford Rail at Rosyth Dockyard. The refurbishment was due to take 5 years to complete, but the last train did not leave the works until 1997, because each train was slightly different to the next train. When the trains had completed the refurbishment the outside was painted in a white, blue and red colour scheme. The insides of the trains have fire-resistant materials and are finished in the Victoria line blue colours, though some have the Bakerloo line brown as they run on that line too. The last 1967 stock in passenger service ran on 30th June 2011. It has been replaced by 2009 stock. ↑ 1.0 1.1 1.2 1.3 1.4 1.5 1.6 1.7 1.8 1.9 "1967 Tube Stock History at TrainWeb". Retrieved 2009-06-23. ↑ 2.0 2.1 2.2 2.3 2.4 2.5 2.6 2.7 2.8 2.9 Horne, Mike (2004). The Victoria Line. Capital Transport. p. 80. ISBN 1 85414 281-X. ↑ 3.0 3.1 "1967 Tube Stock History at Square Wheels". Retrieved 2009-06-23. This page was last changed on 20 March 2017, at 05:47.